The Tcp Client / Sever is a useful tool for testing some services, firewalls and intrusion detection systems. This tool can also be used for debugging the program and configuring other network tools. 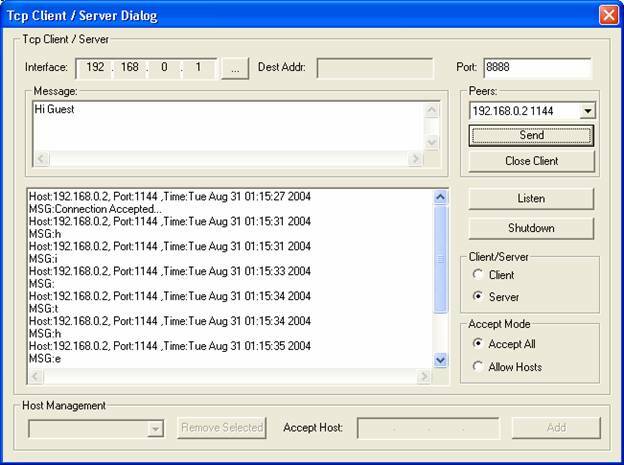 Depending on Client/Server mode the tool works as a Tcp client or server . The field Interface contains local IP address (in case of server mode ) , Dest Addr contains the server address you want to connect ( in case of client mode ), Port is a local port ( for client mode this is a port to which the client is binded, for server mode this is a port to which the server is binded ). The field Peers contains connected client’s Ip address and port ( in case of server mode ). In server mode after filling Ip address and port click on the Listen button to wait for a client. If the connection is established you can enter the message text in the Message field and click Send. To close the connected client ( in case of server mode ) select the appropriate client from the Peers list and click on the Close Client button. Tcp client / server supports two modes of accepting hosts. Allow Hosts - accepts a connection from a specific host. To add a host to the accepted hosts list enter the host Ip address in Accept Host and click on the Add button.